HOLIDAY DRINK... FREEZE COFFEE AS ICE CUBES AND TOSS IN A CU - ProudMummy.com the Web's Community for Mums. Is that just strong black coffee,no milk please? Oh, that sounds so v good, roll on Summer- and 6.00pm! Carol Ann McKeever sounds like a nice tipple for December! Elaine Shanahan tis for Xmas eve fact !!! Simon Galbraith will the new fridge with ice machine do coffee cubes?!?! Elysse we must try this!! Ursula Burke when we having these?? Barbara Benn does this beat a Falibu? Frances Lucas you would prob like this!! Jessica you might like this? Sharon this sounds good to be fair ! Mmmm sounds lush Jenny Goodson !! Victoria Mccandless I'm trying this!! Daniel O'brien would you try it?? 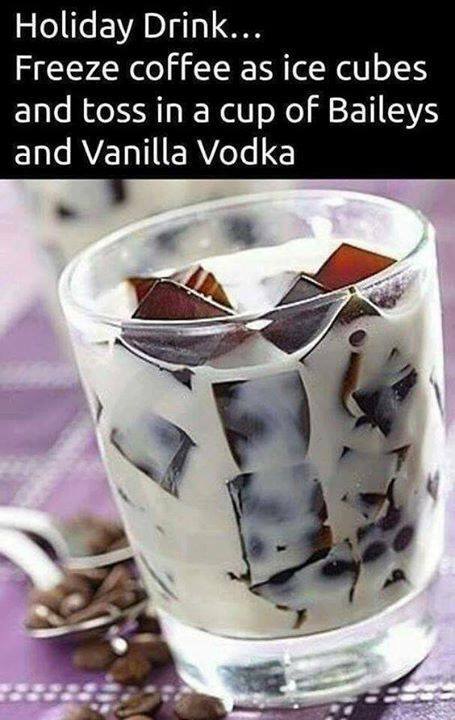 Want this with chic choc cubes not coffee! Looks yum! Caitlin Andrea new morning coffee!!! Dana we should try this to make the working day easier to deal with! Don't do it Dene Cheeseman. I think I almost died last weekend after a night of these! Pauline I think we need to try this! Aleisha McMurray our coffee fix for the next two weeks!!! Carole Arundale thought that would appeal to you😀😀. Could do with one or nine of them right now! Daryl Thompson coffee ice cubes straight in baileys?! Omg this could so work. I'm thinking a splash of malibu might work better than vodka. Vinicius NZ let's do thissss!!!! Camille Simonsen this sounds like a summer drink!!! Jackie Bridges!!! Sounds minging to me but you might like!!! Parris Simmons oh my days we need to try this!!!!!!! Natalie Quick oh maaa god! One for Andy Leach to have as a Christmas treat surely??? Ooh you making these for book club Lisa Niner? Yummy 😋 must try this. Monique Lynch this sounds so good! Dan Kelly this is my new Christmas drink! Lynn Lyna Land, new frappe?! Jo Manwaring Mary Wickham Kerry Lindop feck the pink gin!!! Helen Allen Claire Bambrick this sounds amazing! Ally Walker Helen Walker great idea!! Jaimee Russell Ceara Millichamp Monday night ?? Lisa Kilshaw Danny Kilshaw Abigail Parry Lee Rowley Mark Kay baileys yum! Trish Craddock Si Nicoll Christmas! What do you reckon Lorraine Childerstone? Jill Rideout Minnie Cooper Jo Owen Natalie Passiful ? ?